A River Runs In Me. Life on the fly is the true meaning of living life to your adventurous expectations, while maintaining order in your daily life. It sometimes gets hard to be a weekend warrior with your love of fishing but you must make it happen. Whether its throwing some line out in your front lawn to angling on the Big Horn River, there is a balance. I had heard from a good friend about his tales of fishing in Montana, stories of monster trout, camping on an Indian reservation & just you and nature. So my thoughts began to boil with envy, with little time I was about to blow. Of course my ideal trip would be in the heat of trout season, but what do you expect. My launch date was soon approaching; the weekend of Thanksgiving was when I was loading up my truck to make the 1,100 miles trek to the Big Horn River located on the Crow Indian Reservation, in Southeast Montana. List after list I had jotted down items that I would bring, from my sleeping bag to fly tying gear, I was dead serious about this trip. My family, friends & girlfriend thought I was crazy, guides I talked to where skeptic about the weather and how the fishing would be. I only had one thing on my mind bears, not just a little black bear, big, brown, with fangs & claws that eat people bears. From day one of planning this was on my mind, not the 20 degree weather I would be fishing in, or where I would sleep or even eat. Needless to say I did not encounter in any shape or form a bear. But what I did meet eye to eye was my thoughts that became a reality, world class trout waters hours away from home. 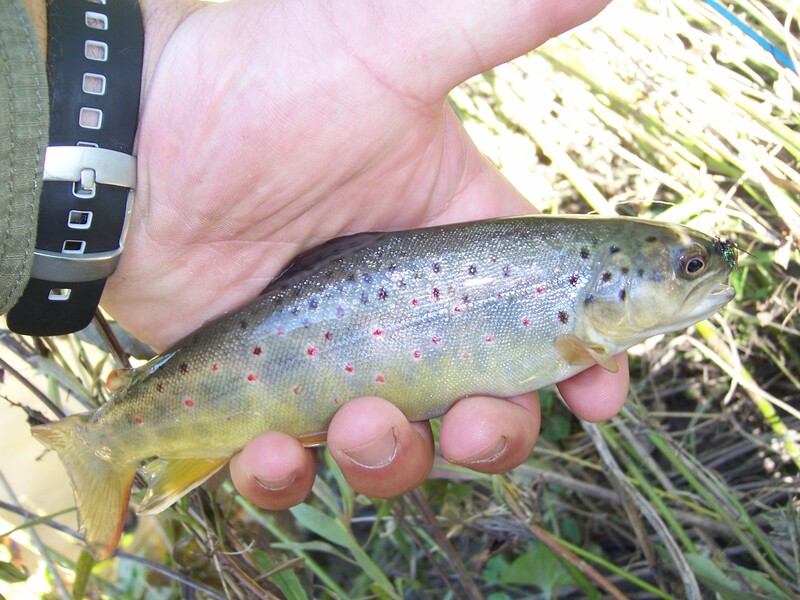 I read & researched about trout and the way they act, what they eat, how to reach them. But nothing beats on the job experience. Another trip under my belt, no one wanted to go but everybody didn’t want me to leave. The countdown was here, I had everything but the kitchen sick that I had accumulated throughout many trips to local outdoors stores and fly shops. After countless bathroom breaks on the side of the road and stopping to sleep in gas stations and eating beef jerky. I was at my Mecca, intimidation was definitely a factor out here. The Big Horn River was huge it seemed to go on forever, with currents I wouldn’t even think about wading into. But I was here and couldn’t go home empty handed. Listening to the weather it was 28 degrees no snow yet till the end of the week, I was planning if all goes well and a couple hook ups, Id be gone by then. I slept my first night on the edge of the Afterbay access, waking up to frost on my window. It was a cold night, not sleeping a wink, due to thoughts of a bear rocking my truck and picking me out of my truck, like I was breaking a peanut shell.Needless to say I had survived the first night. Next morning, I had geared up and headed to the river, filled with thoughts of landing the big one and being a local fly shop hero, I was excited with anticipation to see what was in store for my angling career. Well with the first day I had seen more trout then I have ever seen before, unfortunately none were attached to my leader and fly, I had to figure this all out. I had to find out how…. The town consisted of a few fly shops which were all closed, a little diner which was closed and a gas station. I headed to the gas station for questions, which weren’t answered. Outside the station is were it came together meeting a local guide, who told me that the diner across the street, Polly’s, would open in a couple of hours. I waited, for Darren a cook who guided, tied flies & new the scoop of the town. He made a few calls and at 5:00am the next day I had a date with Chad Becker a local guide who has been at the game for 16 years strong. Five o’clock comes around real quick when you’re sleeping in your truck and haven’t showered in 3 days. Besides eating beef jerky I had a few cans of soup and such I had cooked up on my little Whisper Lite stove, so I was healthy, dry & feed well. Meeting my guide Chad that next morning was something I would never forget. After we ate breakfast, that Darren had cooked up, Great Cook. We strung up my rods with an indicator a San Juan worm a 3 foot dropper then a size 22 pink sow bug. So I had a total of a 12.5ft of leader and rig to cast. At first I was nervous that this might be a total waste of time, due to conditions and the fact we were the only boat on the River. The first spot we came upon was called Hotdog Hole, after the perfect drift; I had quickly landed a nice 11” brown trout. That day we floated the upper half of the river, from Afterbay access to 3 mile access. I had a phenomenal first day with well over 25 fish landed, many browns an a few hard fighting bows, luck was definitely on my side. That day I think every fish I hooked up with went aerial, they jump, out here you have to play the fish a little and know how to handle a fly rod. I could have gone home that day and took a lot with me, but needed more. After loading up the boat we headed back to Polly’s, which was a small shop in Fort Smith on the main drag. It had six cabins for rent, a fly shop and a little restaurant that was run by Darren, a real character. That night I was well feed, had a warm place to stay then had a chance to sit with a couple of guides, drank some beers and tied some flies with the pros. That next day was a little different then the day before, I asked Chad to test my skills a bit, give me a challenge, and see if I could actually do this in tough conditions. Another 25 degree day started out snowing and extremely windy. Chad and I waded to a little spot on the lower half of the Big Horn were he showed me how to read the water, were fish would be sitting and casting in tight spots with little room for error. My drifts had to be flawless. 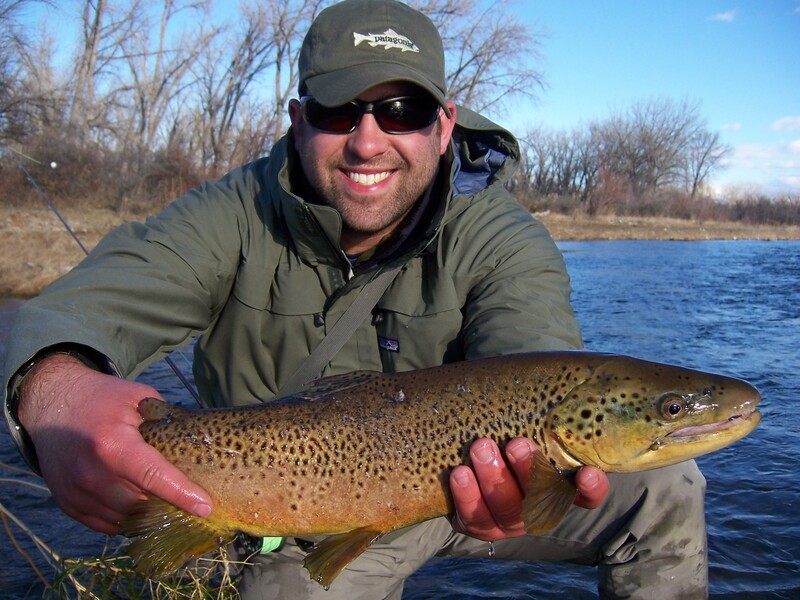 I had landed a few 18-20″ browns and a 20″ rainbow. All big fish. As the day went on Chad kept saying how he wanted me to get a 20″ plus fish. I was more then willing but, I guess he wanted to see how bad I wanted it. A little further down the river we dropped anchor, and waded back in to this channel up stream, that split between an island. We walked around the island and on the bank and he said well here’s your shot. Two huge browns, 20″ plus, just laying up feeding. We walked as quietly as we could back down the bank and at the end of this island, my shot was about 11 o’clock over my left shoulder. Straight into the wind gusts, coming over this bank. I striped out some line and began to let out my leader on my 5wt, wind was just pushing it back in my face. As if the wind wasn’t enough, there was a huge glare on the water right over my fish, so I couldn’t see my indicator getting a strike, just had to feel the strike. OK so this shot was near impossible but Chad kept saying ” you want a challenge well you got one” This was a tough shot. Cast after cast, I tried like heck to get this little fly out there I wasn’t even coming close. With a break in the wind, I had an opportune time, and let it rip, A not so perfect cast, but a perfect drift. Slam…… this fish hit like it was the only thing it had eaten all day. After what seemed to be a 10 round fight, I finally tired him out, netted and released a 22″ brown trout. Nice way to end the day. When your living life on the fly! With a big fat goose egg for me this last trout season I was on a mission to land one trout on my own. It was the last weekend of trout season for the year and I had some tough choices to make. Play it safe with better luck next year & take in a few family functions that will bore me to death. Or hear flack for the rest of my life & pack up the truck and head north to the spring creeks of Wisconsin, for one last shot at my first trout. Ummmmmm…. What a tough one. So I took my chances and had to go north, 4 hours later I’m faced with bugs clawing at my every hint of flesh and weeds up to my ears, after a string of days with plenty of rain, the local shops kept saying its not about the fish but the experience. Many places to choose from in the driftless area of Wisconsin, I wanted to check out a few favorites. Not knowing what the heck as far as, match the hatch and all that jazz, hoppers and terrestrials were a safe bet. Besides whats seemed to be millions of grasshoppers were darting around like shooting stars, it was a good call. With my 4wt in hand, I decided to take a few shots at a little crook in the creek about 30ft up stream from a roadside bridge. Like I had mentioned before it’s late summer, weeds are about 8 feet tall, no joke. Between swatting bugs and untangling my back cast, I managed to land my hopper in a nice little drift right off the bank. All this is happning I get a mosquito bite on my lip, and feel instantly my lip puff up like a golf ball. I was like Quasimodo, drooling out the side of my mouth. A madman swinging a stick in the air with a bump the size of a child’s fist on my face, not a good feeling. That day I’d broken my cold spell, I landed 4 trout that day. Beautiful in its spectrum of colors these little wild trout, were a gift from above. My first experience, as a man in waders, made a huge impression on me. While driving home on this trip I began to count my blessings on how lucky we are to have wild trout waters so close to home. I realized these waters needed to be kept clean and as an angler it is my responsibility to take care of this natural wonder. I wanted to be more frugal in my way of living, live more green. I’m doing my part, are you? Jet lagged from the night before & filled with anticipation, waking up in a country way to far from home, with a guy in the next bed I barely know. Along with a room full of gear enough to fill a local shop, I had no clue what was going to happen. I was out of the local pond and into a world I only heard and read about in the local fly shop and magazines. This is how my first trip to live out my dreams began. 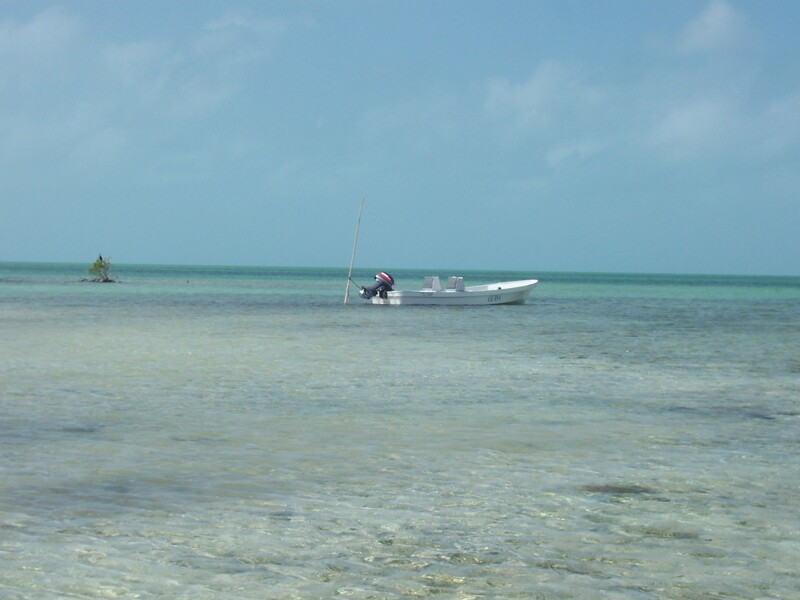 I had made it to my destination in search of my first real hook up, the bonefish. After spending countless hours, reading, casting, buying and asking questions. I was here, the big leagues. Hearing stories at dinner of guys who have been fishing for 20+ years , myself having less then 6 months under my belt, was ready to do the deed. Being fortunate enough to get here with the right gear (rods, reels, flies, etc.) I was up to bat 5:00 am the next morning. ” dem bones, dos flashes”, So with my little shrimp like fly in hand and line stripped out , I began to cast. Looking at my back cast trying not to hook myself or the guide, I took deep breaths and got into my rhythm, and let my loop straighten out. With a few strips in , I began to get the hang of it. Another cast out, strip, strip, nudge….ZZZZZZZZZZZZZZZZZZZZZZZZ….There’s goes my fly line. Tights lines and a bent rod what a combo. That day turned out to be a day that will humble and still build up this newly made fly fisherman. Many fish lost and a few that were brought in, yet it was well worth the time and effort. That week I had learned many knots, casting on a clock, fighting fish, slinging an 8wt all day is like using a hatchet on a rock & whats its like to get into your backing. All in all I had met some great people, especially the locals and there warm hospitality. Down time at night, with a smile stuck on my face from that day, I had the chance to spend time in this little island town while not feeling like a complete tourist, the local restaurants offered great food. Riding my green beach cruiser bike home that night I sort of had a little swagger to me, like I just climbed Everest or finished the Iditarod . My first salt trip had came up successful, with a learning curve that I will remember forever. Life on the fly. As I kick back by the pool, the sun is beating on my face similar to a desk lamp in a dark room, its therapy for this land locked kid. I glanced over and noticed a gentleman using his hands to create what appears to be art in some small natural form, not knowing that this tiny object would be my way out of the daily grind an addiction that drives my every thought, a pit for my money. With much wonder I had to ask, this wasn’t just a normal 9 to 5 activity that is done half hearted it is a way of life that had a learning journey attached to it that seems to be the heart beat of few. Matt was his name and tying Crazy Charlies’ was this little art piece, Matt was from the UK, who was on his dream adventure that made me change my outlook on life and all that it had to offer. He was preparing what seemed to be an army of flies, ready for battle, for an elusive fish I had to learn more about. Matt was telling me of the thrill of the hook up that clears your reel in seconds and fights for whats seemed to be hours on end. Fly fishing was born in my eyes, heart & soul. There comes a point in every fly fisherman’s career were he is faced with the needs, the wants of seeking out a gator of a trout, traveling to an exotic local, or some my say “just the drug of the tug”. Track one anglers passion to seek out these places and for others to share in his experience from success stories to misadventures. Life on the fly. Hey the crew at Dryfly Media sent me a copy of their latest project: Rivers in Motion. An artistry and visual documentary of famous western big rivers such as the Yellowstone & Madison. 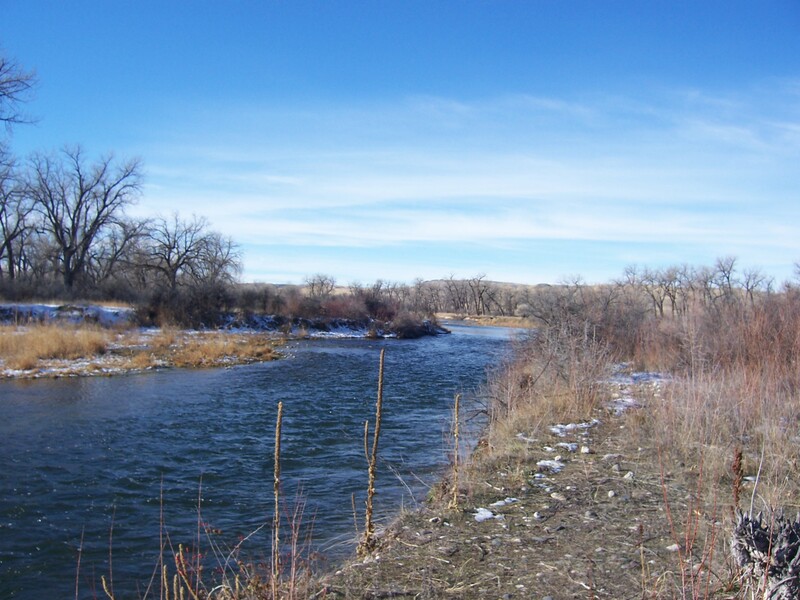 I chose to review the infamous Gallatin River in southwest Montana. WOW!! Watch out AEG you have some vids to compete with. If you enjoy a moment to yourself while day dreaming of your next 2 week troutbum bender. These vids are for you. I enjoyed the natural sound, no techno-quasi music, that takes away from the pure majesty of these rivers. I love how DFM captured the true largeness of these rivers with many wide angle shots with gorgeous mountain ranges in the back ground, makes your feel like your at the bottom of the huge valley this pure river runs through. Thank you guys at DFM I really enjoyed the video. Purchase them all at dryflymedia.com. Great product, great idea.